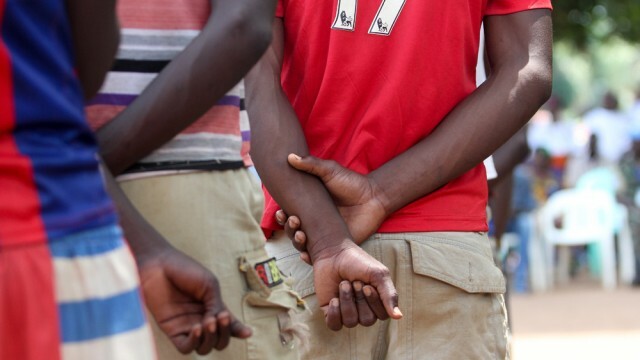 The anti-Balaka militia has released 163 children from its ranks in the Central African Republic (CAR), a country where as many as 10,000 youth have been recruited to fight for armed groups since 2013. The children were handed over at a ceremony on Friday in the northern town of Batangafo that was facilitated by the UN children’s agency (UNICEF) and the UN peacekeeping mission (MINUSCA) in the country. The youth were freed from the anti-Balaka group, which still vies with the Seleka rebels for control of this town where some 30,000 people are living in a refugee camp. “The move to end child combatants [in CAR] is not moving fast enough, yes, but it is an ongoing process [and] while the leaders of the armed groups have committed to stop recruiting children, it does take time to implement on the ground,” Donaig le Du, a spokesperson for UNICEF in Bangui, told Al Jazeera on Saturday. Le Du said that negotiating the release of this particular group of children took around two months, and it was a process that could not be rushed. “There is no point in rushing the process when there is little infrastructure in place to assist in the rehabiliation of the children,” she said. Friday’s handover by the anti-Balaka group raises to 645 the number of children released as part of a deal among 10 armed groups in May, to release all children from their ranks. However, most of the children freed so far have been from the anti-Balaka group, because those among the ranks of Seleka have been more isolated, officials say. The CAR has been embroiled in conflict since Seleka rebels took the capital in 2013. Since the coup of 2013, the government changed hands once more in January 2014 and remains fragile and unstable. Following a spate of abuses by the Seleka, vigilante groups known as anti-Balaka (anti-machete), made up of animist and Christian fighters, emerged to fight off the new leadership. On Friday, a spokesperson with the UN Refugee Agency (UNHCR) told Al Jazeera that the country “was not at peace”, after clashes between militia groups saw 10 people killed and up to 5,000 people displaced from the central town of Bambari. Le Du from UNICEF said that most child combatants were dragged into the conflict after experiencing a traumatic event, like the killing of a family member. Many of the child combatants involved with anti-Balaka fighters were part of vigilant groups, living in their own communities. “Today marks an important step forward towards the end of the recruitment and use of children by armed groups in the Central African Republic and of course a step towards concrete peace in the country,” Diane Corner, Deputy Special Representative of the Secretary-General with MINUSCA, was quoted saying in a statement on Friday. UNICEF estimates that 6,000 to 10,000 children have been linked to armed factions since 2013, when deadly violence erupted between Muslims and Christians in the country. The UN children’s agency seeks to reintegrate the children with families where possible, or provide job and skills training, along with psychological services. Still, the youth remain at risk if they return to areas afterwards that are still under the control of the fighters. The post Militia releases 163 child soldiers from ranks in CAR appeared first on African Media Agency.